Visa - Mastercard - Checks Welcome! 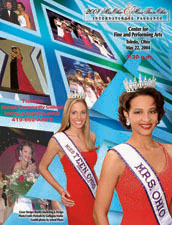 A copy of the 2006 pageant. A copy of the 2006 program book. A copy of the 2005 pageant. A copy of the 2005 program book. 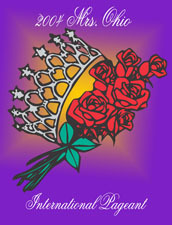 A copy of the 2004 pageant. A copy of the 2004 program book. 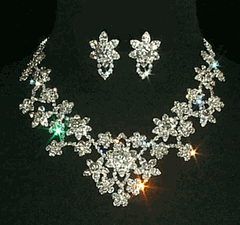 This Magnificent necklace is 2.75" at the tallest point. It is adjustable from 14.5" to 17". 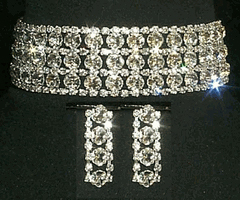 The pierced earrings are 1" tall. Plated in Sterling Silver. from 12" to 15." The pierced earrings are 1.25" tall. and is adjustable from 12" - 15.25" long. Standard 2 3/4" diameter. 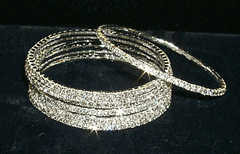 Single row rhinestone bangles. Silver plated. 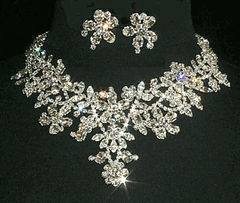 This Magnificent bib style necklace is 2" at the tallest point. I t is a 14"-17" adjustable necklace. The pierced earrings are 1.25" tall. Plated in Sterling Silver. Click Here To Pay Your Application Fee Now! Visa/Mastercard Welcome. Click Here To Order Store Items Now! Visa/Mastercard Welcome.